Central reservations have for decades been a tactical issue for contractors, long narrow trenches usually full of drainage and coms ducts has made them troublesome and time consuming. Central reservations have been a key field of revenue for Sidewinder® paving since the early 90’s and with the advent of VCB’s over the last 10-15 years is still an area that Sidewinders® can save you time and money. 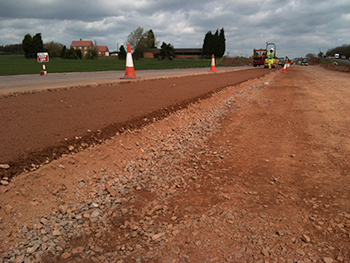 The Sidewinders® ability to place and grade all layers from capping to wearing coarse from 300mm wide to 3.0 meters wide and from 1.0 meter below to 200mm above carriageway at virtually any grade or profile makes this job easier to program and faster to complete. An advantage inherent in the use of our Sidewinders® for central reserve paving is the opportunity to lighten the construction detail thus offering material cost savings. Since there is no need for any delivery trucks or plant other than the rollers providing compaction to sit in the central reserve there is a significantly reduced risk of damage to any underground services or utilities. 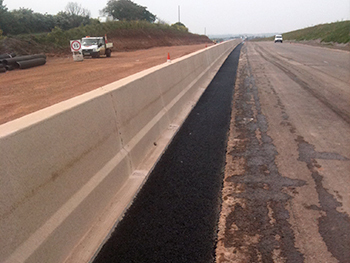 With concrete barriers being adopted as the standard Vehicle Restraint System on UK motorway and trunk road networks, our Sidewinders® play a significant role in VRS schemes. 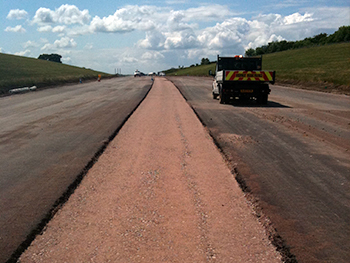 Sidewinder® involvement on VRS schemes has consistently proven to out-perform all other traditional or alternative methods of construction surfacing. Accurate and consistent level control through adopted laser levelling systems combined with the ease of material feed to the laying area provides a consistent, quality finish whilst yielding higher outputs. These advantages can result in greater efficiency, programme enhancement potential, improved site cleanliness and good housekeeping, plus an increase in site safety through the reduction of moving plant on site. To see examples of our Sidewinder’s® Central Reserve hardening work in action click here. Alternatively to contact us directly click here. To find out more about our paving solutions or how Sidewinder UK can provide an efficient and viable method of working that can out-perform alternative, more traditional methods please contact us now. We will be happy to help and answer any questions you have.